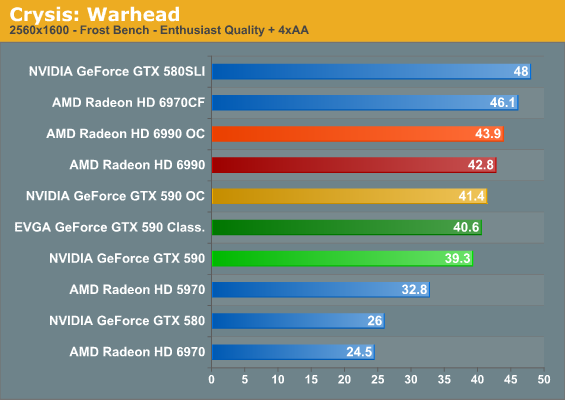 Kicking things off as always is Crysis: Warhead, still one of the toughest games in our benchmark suite. Even three years since the release of the original Crysis, “but can it run Crysis?” is still an important question, and for three years the answer was “no.” Dual-GPU halo cards can now play it at Enthusiast settings at high resolutions, but for everything else max settings are still beyond the grasp of a single card. Crysis is often a bellwether for overall performance; if that’s the case here, then NVIDIA and the GTX 590 is not off to a good start at the all-important resolution of 2560x1600. 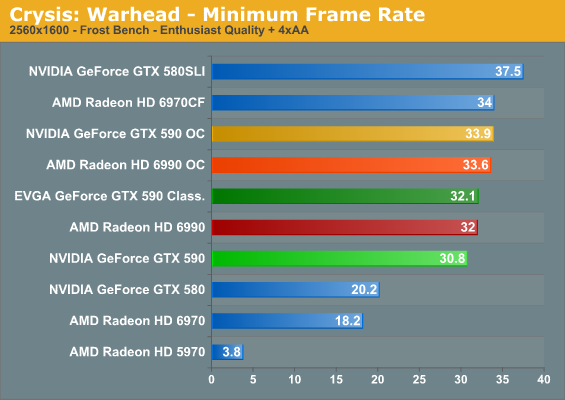 AMD gets some really good CrossFire scaling under Crysis, and as a result the 6990 has no problem taking the lead here. At a roughly 10% disadvantage it won’t make or break the game for NVIDIA, but given the similar prices they don’t want to lose too many games. 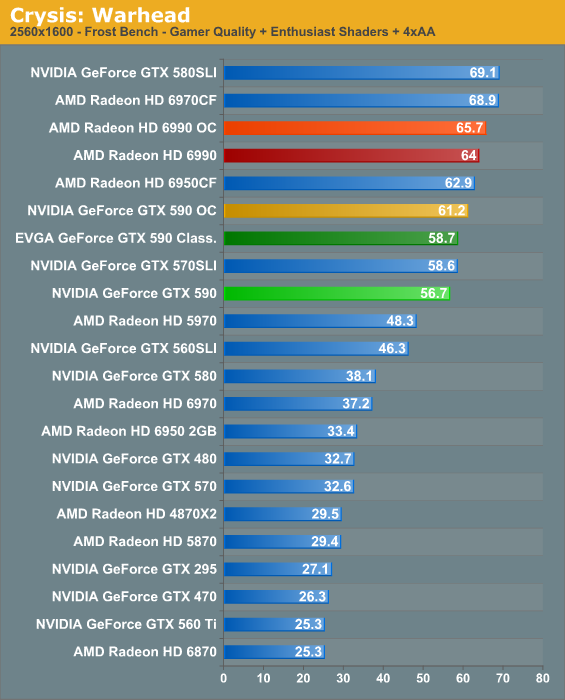 Meanwhile amongst NVIDIA’s own stable of cards, the stock GTX 590 ends up slightly underperforming the GTX 570 SLI. 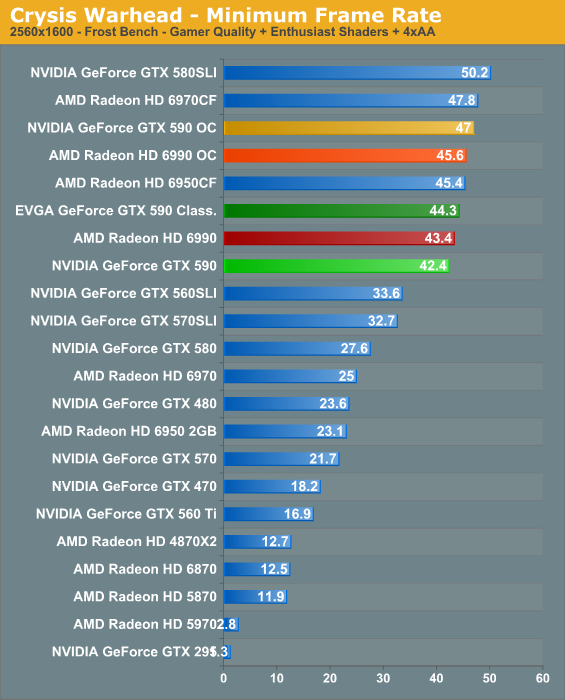 As we discussed in our look at theoretical numbers, the GTX 590’s advantage/disadvantage depends on what the game in question taxes the most. Crysis is normally shader and memory bandwidth heavy, which is why the GTX 590 never falls too far behind with its memory bandwidth advantage. EVGA’s mild overclock is enough to close the gap however, delivering identical performance. 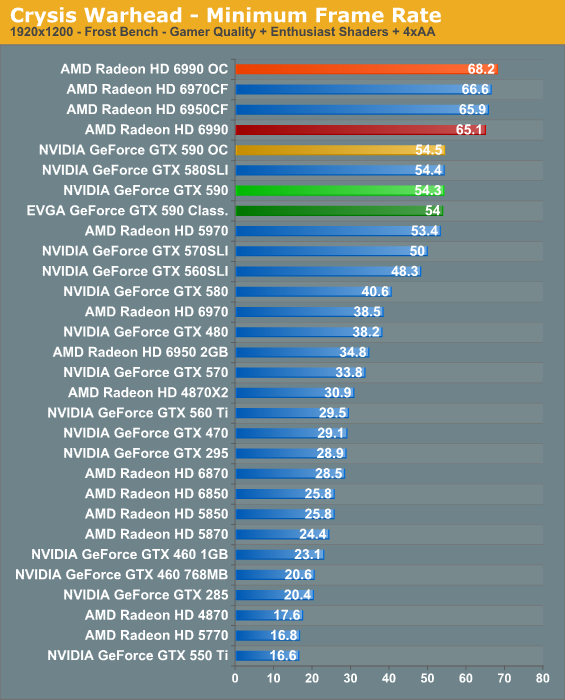 A further overclock can improve performance some more, but surprisingly not by all that much. 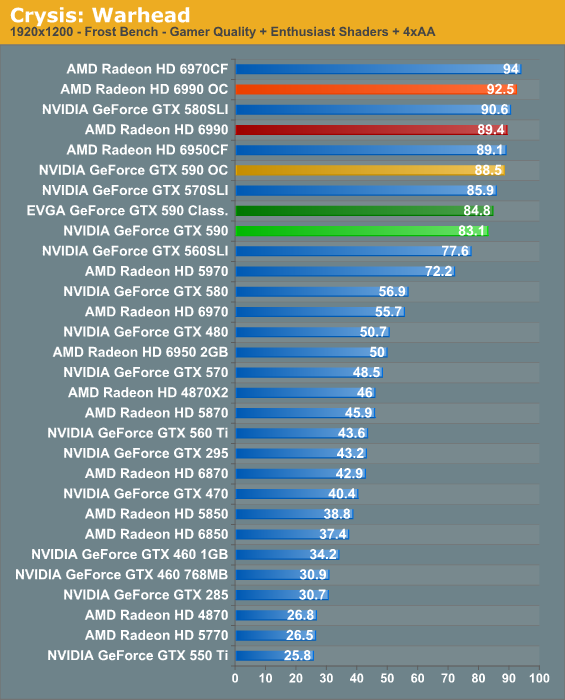 The minimum framerate ends up looking better for NVIDIA. The GTX 590 is still behind the 6990, but now it’s only by about 5%, while the EVGA GTX 590 squeezes past by all of .1 frame per second. "...NVIDIA’s advice about SLI mirror’s AMD’s advice..."
For $700 I'd rather buy a whole new PC. Whats the point of playing games at larger resolutions than 1600x1050. In fact I'd say that 720p resolution is probably the best to play games at, because it tends to be easier to follow since pixels kind of move faster and you have more precision and smoother gameplay experience.